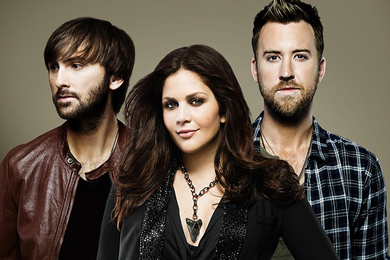 Lady Antebellum revealed plans today (Aug. 27) to extended their previously announced headlining Take Me Downtown Tour with new dates scheduled through April 2014. Previously announced North American tour guests Kip Moore and Kacey Musgraves will continue with the group through the second leg, beginning Jan. 9 in Charleston, W. Va.
First tour dates go on sale Sept. 13. Fans can click here for the most updated information for all dates, and here for VIP opportunities. Last year Lady A hosted over one million fans in 11 countries on their first headlining world tour, which earned them Billboard Touring’s Breakthrough Award; CMA’s International Artists Achievement Award; and will accept the Jim Reeves International Award at this fall’s ACM Honors.